Phra Borommathat Chaiya constructed along Mahayana Buddhist’s beliefs of the 7th Century, the great chedi is reputedly the best preserved Srivijaya artwork in Thailand. The stone chedi has 3 receding tiers, each of which are decorated with small stupas. The Buddha’s relics are enshrined inside the chedi. Short Description: Wat Phra Boromathat Chaiya Rat Worawihan is the most important Buddhist temple of Surat Thani, and also one of the most beautiful ones. 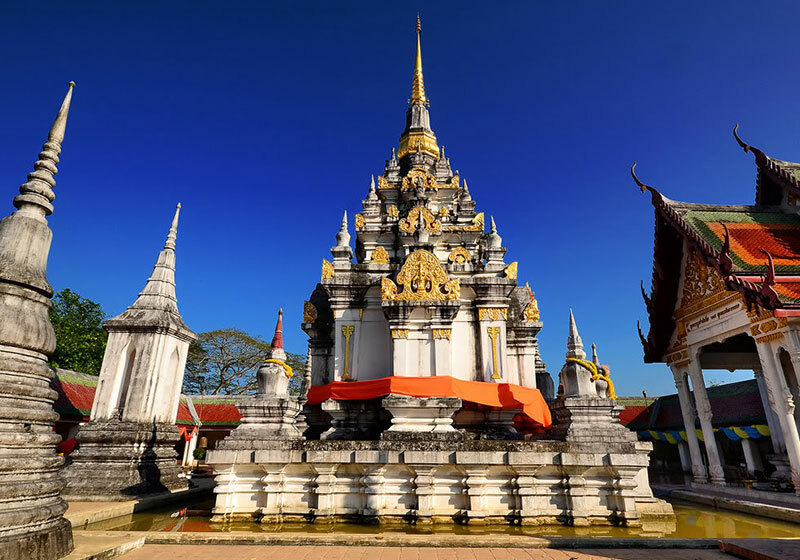 The central chedi in Srivijaya style with its many golden ornaments is even the iconic symbol of the province Surat Thani.